We invite you to participate in our Sponsor Dog scheme which contributes to the ongoing care of your chosen dog by way of a monthly or yearly subscription. We ask for a minimum of £15 a year and for that you will receive a Certificate of your sponsored dog, wristband and either a Greyhound Gap Pin Badge or Keyring. Corky, a young whirrier (whippet/terrier), arrived at Greyhound Gap during August 2008. He is very terrier like but with longer legs and a whippety tail! Corky was in our local pound where it was obvious to the staff that something was not quite right. He was vet checked and everything seemed to be okay so it was thought he may have a problem with his co ordination and that he would grow out of it. As it was unclear what was going on with Corky, the pound realised they could not rehome him directly so asked if Gap would step in. Once in our care we found he had a middle ear infection; at first we were sure this was the cause of the problems. Sadly even after treatment it did not clear up and his behaviour continued, as it does to this day. Corky will often have vacant moments, or moments where he goes round in circles. He sometimes has blank episodes where he comes across as being petrified reacting to something that is not there and gets really fearful. Following further veterinary checks and tests is is thought that Corky probably has brain damage perhaps from a virus during early puppyhood or lack of oxygen from a difficult birth. After a short time in foster care it also became obvious that there was a problem with Corky's jaw. For some reason the jaw does not open as wide as it should. As a consequence he struggles to eat his meals and has to have his food softened. The problem was investigated at the vets where he had an anesthetic and x-rays. The x-rays showed nothing untoward so biopsies were taken. The samples were sent to the States for specialist tests in a bid to find the cause of the problem. All tests came back clear, so little Corky still struggles to open his jaw as wide as he should. Sadly we have no idea how or if this will progress and if things will get more difficult for him as he gets older. 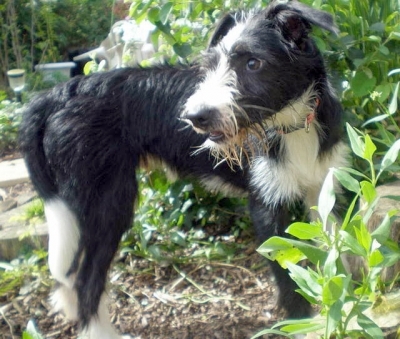 As Corky has so many problems at such a young age it was decided that he would become one of our sponsor dogs so that Gap can continue to oversee Corky's well being. It also gave whoever offered him a home the peace of mind that they would have full support for Corky for the duration of his life. As Corky was very happy and settled in his foster home we felt that it was in his best interests to stay with his foster carers (with their agreement of course!) as they were well used to dealing with him and his problems. We cannot thank Carol and Huey enough for taking this odd, but beautiful little chap under their wing. They have taken such great care of him and have made a lifetime commitment to him and his happiness. If you would like to sponsor Corky as a gift for someone there is an opportunity at the checkout to add special notes about your order (such as the name to go on the certificate) and the option to choose an alternative delivery address if required.